A few days ago, I went to a hotel with some of my friends. “Aafa, Cha”- a boy of about six came to me with a cup of tea. “Aar kisu lagbo?” he asked me with a smiling face and bright eyes, being unaware of the hardships and struggles of his life. While paying the bills we noticed that the boy was being beaten by the manager. I could not make out the reason but it was a very cruel incident to watch. Unfortunately, this is the everyday scenario of 80% of child workers in Bangladesh. Child labour is a pervasive problem throughout the world, especially in developing countries like ours. Child labour was not seen as a problem throughout most of history. In the west, during the Industrial Revolution, child labour was commonplace as it was cheap and children were easy to exploit. An estimated 246 million children are engaged in child labour. The Asian and Pacific regions harbor the largest number of child workers in the 5-14 age group, 127.3 million in total. Sub-Saharan Africa has an estimated 48 million child workers. Almost one child in three below the age of 15, works. Latin America and the Caribbean have approximately 17.4 million child workers. Fifteen percent of the children work in the Middle East and North Africa. And in Bangladesh the total number of working children aged 5-17 years in rural areas is estimated at 6.4 million as against 1.5 million in urban areas. Children are working in hazardous situations or conditions, such as mines, construction sites, with chemicals and pesticides in agriculture or dangerous machinery. The most controversial form of work includes the military use of children, camel jockeys as well as child prostitution and in drug trafficking. Ahmed, a five-year-old boy was trafficked from Bangladesh to the United Arab Emirates to be a camel jockey. He was forced to train and race camels in Dubai for three years. “I was scared. If I made a mistake I was beaten with a stick. When I won prizes the camel owner took everything,” says Ahmed. He was only allowed to return home after a Bangladeshi official identified him during a visit to Dubai in November 2002. Bangladesh National Women Lawyers' Association (BNWLA) provided him with the specialist support and help he needed to resume his life with his family. 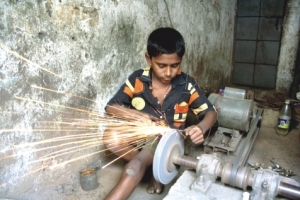 After the Child Labour Deterrence Act was introduced in the US, an estimated 50,000 children were dismissed from their garment industry jobs in Bangladesh, leaving many to resort to jobs such as stone-crushing, street hustling, and prostitution -- all of which are more hazardous and exploitative than garment production according to a UNICEF study. In 1995 Bangladesh Garment Manufacturers and Exporters Association (BGMEA), ILO and UNICEF signed a Memorandum of Understanding (MOU) to eliminate child labour from more than 2000 garment factories and to provide these child workers with education and a monthly stipend of 300 takas. The ILO, with the help of NGOs, also concluded a two-year pilot project last month to educate 5000 children who work as domestic helps in Dhaka. But all these initiatives are just specks in the sand. Many think that working as a house help is safer for children but ill-treating household helps are now very common. Minor girls work as unpaid household helps and are especially vulnerable to exploitation and abuse. Shouting, finding faults, the use of insulting and filthy language, obscene words, beating, slapping, whipping, and being burnt with hot spoons or rods are common types of violence. These little children come to another house with the hope of getting only some food and shelter. And what do they get? Nothing but brutality! On the other hand, some cases reveal that for many children working is the only hope they have for escaping is experiencing. But majority of child domestics, are unable to read and write and have never been to school, nor had been taught at home. It is impossible to imagine how their future generation will lead a better life. Absolute poverty. 13-year-old electrical assistant Abdul takes care of half the expenses of his family of six, with his daily earnings of $1.5. Another young boy fourteen-year-old Nuru works in a hot and fume-filled factory in Dhaka, an unhealthy place for a child. With his earnings Nuru pays for a tutor, school books and part of the rent for his family home. Nuru wants to get a good job and make sure his children will have a better childhood than the one he is experiencing. But majority of child domestics, are unable to read and write and have never been to school, nor had been taught at home. It is impossible to imagine how their future generation will lead a better life. Poverty is the single most important factor responsible for the prevalence of child labour in the country. Parents' perceptions greatly influence their children's participation in the labour force. But school represents the most important means of drawing children away from the labour market. Studies have correlated low enrollment with increased rates of child employment (ILO 2001). Schools provide children with guidance and the opportunity to understand their role in society. Therefore, many insist on immediately abolishing child labor in developing countries and requiring children to go to school. But this approach is unfeasible for many reasons. Child labour is a sheer reality in Bangladesh. The prevailing socio-economic conditions do not permit outright elimination of child labour overnight. But we have to move forward. Experiences indicate that the elimination of child labour from one particular industry may culminate in an increase in child labour in another. Moreover, it is not possible to force the child workers to attend full-time schools since the lost income is critical to the survival of their families. Under these circumstances the formulation of a National Plan of Action for the elimination of child labour in the country is a need of the hour. Children have the right to be loved, cherished, educated, clothed, pampered, fostered as children when they are children. They have the rights to be protected from economic exploitation and from performing any work that is likely to be hazardous or to interfere with their education. Child labour is a denial of the right to enjoy childhood and achieve full physical and psychological development. It's we, who can play a great role in eliminating child labour from the country. A bright inspiration is Om Prakash Gujar, a 14 year old Indian boy who won the International Children's Peace Prize in 19 November 2006, in the center of Dutch Government in The Hague, The Netherlands because of his brave fight against child labour and child slavery. So to put an immediate end to the most intolerable forms of child labour we need determination and sympathy. Likewise, sponsoring a child through Plan can give a child and their community access to things they need to survive and grow. By sponsoring a child we can reach out to a child who desperately needs our help.